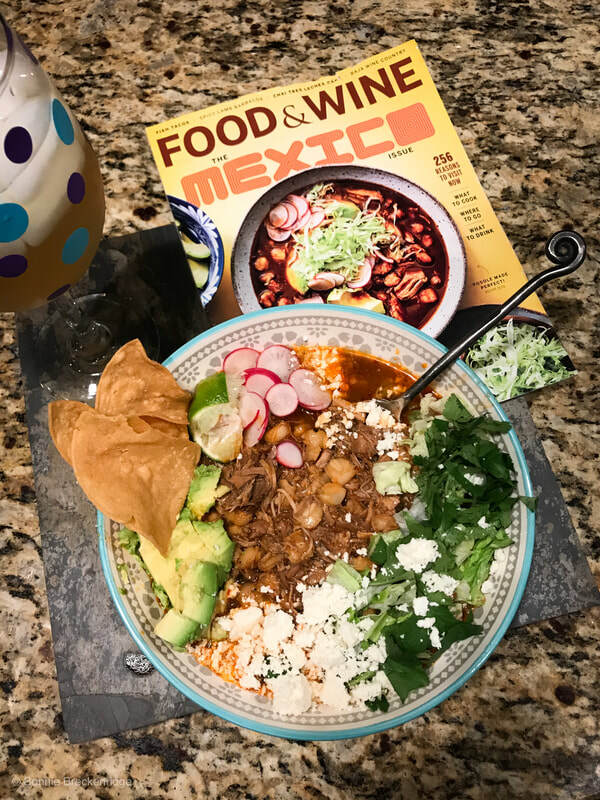 I already have a really easy delicious Classic Posole recipe that I make often and everybody raves about it. But I'm in the midst of trying to make every recipe in the Mexico edition of Food and Wine Magazine. I've already made several and they have all been outstanding. The cover recipe is a bit labor intensive and will take most of the day. It's perfect for those Sunday afternoons where you have nothing to do but cook, read and fill your home with the smells of Mexico. The garnishes really make this dish amazing. I added a little smoked paprika to mine because I felt my chili mix wasn't robust enough. It's even better the next day. This long-simmered tomato- and pork-based soup was Priya Krishna’s hangover cure when she lived in Mexico. Her version builds layers of flavor from bone-in pork, garlic, ginger, and dried chiles. The finishing touches are just as important: Everyone can customize their bowls with crunchy radishes and lettuce; creamy avocado; fresh lime juice; and dried oregano, rubbed between the palms to release its fragrance. This soup keeps well in the refrigerator for up to three days: Simply let soup cool, cover, and refrigerate. Reheat soup gently before serving with garnishes. Step 1 Combine pork shoulder, spareribs, 6 quarts water, and 1 tablespoon salt in a large stockpot. Bring to a boil over high, skimming off and discarding foam from surface during first 10 minutes of cooking. Place onion, garlic, ginger, bay leaves, and oregano in center of a large piece of cheesecloth; gather edges of cheesecloth together, and secure with twine. Add to pot; reduce heat to medium-low, and gently simmer, uncovered, 1 hour and 30 minutes. Step 2 Remove cheesecloth bundle from pot. Remove onion, garlic, and ginger; set aside. Discard bay leaves and oregano. Add hominy to pot; simmer over medium-low, uncovered, until rib bones can be easily removed from spareribs, about 1 hour and 30 minutes. Step 3 While pork mixture simmers, split ancho and guajillo chiles; remove and discard stems and seeds. Place half of the chiles in a large, deep skillet over medium. Cook, turning occasionally, until toasted evenly on both sides, about 1 minute. Remove to a plate; repeat procedure with remaining chiles. Return all toasted chiles to skillet; add water just to cover chiles. Bring to a gentle simmer over medium; cook until chiles are soft and rehydrated, about 15 minutes. Remove from heat; cool slightly, about 15 minutes. Drain chiles, reserving cooking liquid. Taste cooking liquid. If it tastes bitter, discard. If it tastes faintly of raisins, reserve 1/2 cup. Step 4 Transfer rehydrated chiles and either the reserved 1/2 cup chile cooking liquid or 1/2 cup water to a blender. Add onion, garlic, ginger, and 1 tablespoon salt. Process until smooth, adding splashes of stock from pork mixture in stockpot as needed to achieve consistency of applesauce, about 1 minute. Pour through a fine wire-mesh strainer into a bowl; discard solids. Step 5 Heat oil in a 10-inch skillet over medium-high. Carefully pour strained chile mixture into skillet. (Mixture will splatter.) Cook, stirring often, until reduced by half and darkened in color, about 30 minutes. (Partially cover skillet to reduce splatters, if desired.) Remove from heat, and set aside. Step 6 When pork mixture has finished simmering, remove spareribs from stockpot, and set aside until cool enough to handle, about 5 minutes. Remove and discard rib bones and tendons from spareribs. Chop meat into bite-size pieces, and return to stockpot. Stir in reserved chile sauce. Bring to a simmer over medium-low; cook until flavors meld, about 1 hour, skimming fat from surface, if desired. Stir in remaining 2 teaspoons salt. Step 7 To serve, place tostada shells; lettuce; chicharrones, if using; Cotija, if using; radishes; avocados; and limes in separate bowls. Ladle soup evenly among 10 large bowls. For each serving, place a pinch of oregano between palms; rub over and into soup to release its aroma. Serve soup alongside bowls of garnishes for diners to customize their servings. Make AheadPrepare soup through Step 6; cool soup, cover, and chill up to 3 days. Prepare garnishes for Step 7 just before serving. Rewarm soup gently before serving with garnishes. NotesSoaking dried chiles draws out their flavor, including bitterness, if prevalent. If the resulting liquid is sweet, incorporate it into the dish. Discard it if it tastes bitter.